Famous for its historical buildings, monuments, gardens and fountains Braga is a beautiful city in the heart of the green Minho region where religious devotion in the form of many churches and other symbols of faith lies juxtaposed with the typical bustle of a modern city complete with restaurants, bars and a renowned nightlife, owing in some part to the local universities. Braga’s importance as a religious centre is by no means a recent phenomenon and pilgrims have been journeying here for many centuries, indeed it is said that the Visigoths would come here to denounce their heresies. Furthermore, in the 12th century, as the seat of the Portuguese archbishops, it became established as the religious capital of the country. This rich historical and cultural past has been lovingly well kept, even to the extent that local laws prevent the construction of high buildings in the certain areas so as to preserve the ancient beauty. Equally, commerce and culture have always been significant here from its founding in 300BC by the Celts, through Roman times and its status as administrative capital of north-western Iberia to modern times and the prosperity enjoyed by local industry. 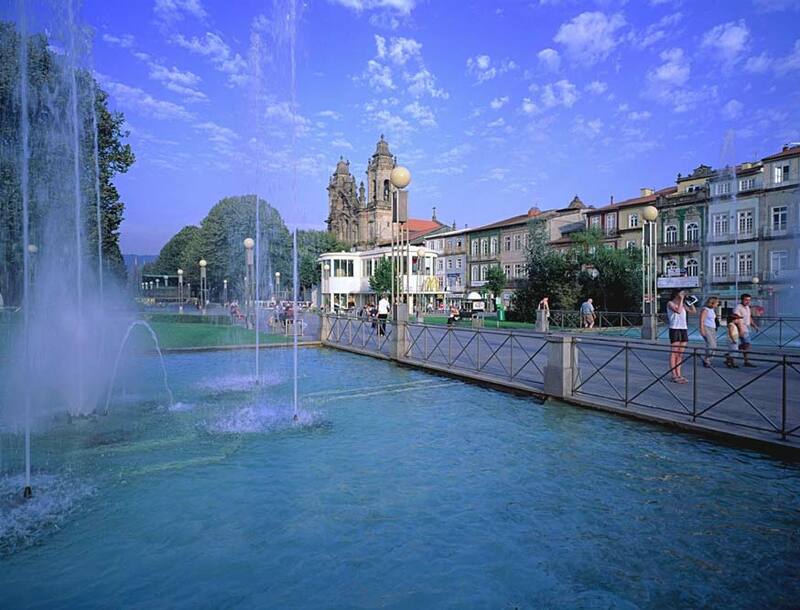 The name Braga itself is in fact derived from the Roman Bracara Augusta, the name given to the town in honour of the then emperor. At the heart of the historic district lies the Cathedral, The Se, built in the 12th century by Henri de Bourgogne and Dona Teresa on the site of the church of Santa Maria, which had been destroyed by the Moors centuries beforehand. 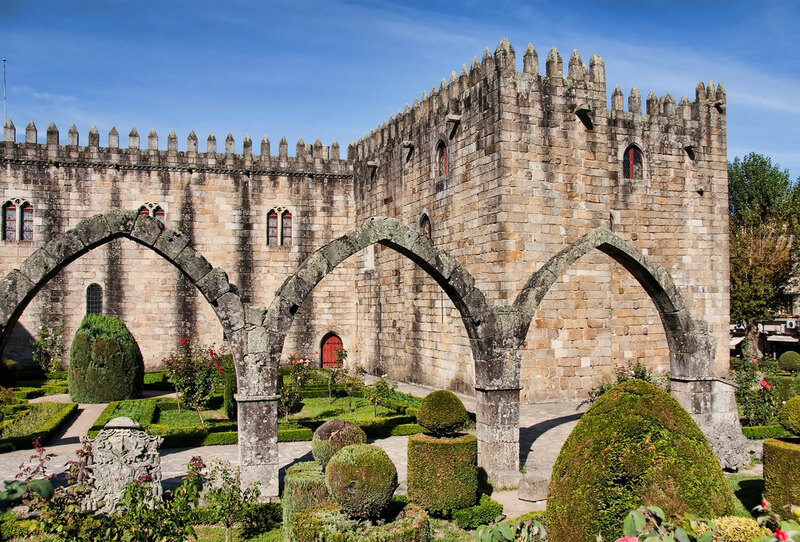 Their tombs lie together in the Chapel of Kings despite Dona Teresa having been exiled from Braga on the death of her husband due to an adulterous affair. With various alterations over the years, many different architectural styles now adorn the cathedral, from small Gothic arches either side of a large stone-laced Roman example to a Manueline statue of the Virgin Mary with a suckling baby Jesus found in the apse. Another formidable statue here is positioned in the large rooftop niche between the bell towers and again represents the Virgin and Child. Inside the Se, passing two impressive 18th century organs, a collection of Braga’s most important works of sacred art is kept and can be viewed for a small fee. Baroque wood carvings can be found on the main altar in the 16th century Igreja da Misericordia and, although in its present form dating from the sixteen hundreds, the Igreja de Sao Vicente was originally founded in the 7th century. From the beautifully manicured gardens of Santa Barbara, the imposing medieval walls of the Archbishop’s Palace can be seen and in one of the central streets the Arco da Porta Nova is an archway that served for many years as the main entrance to the walled city and was constructed in the 1700s. 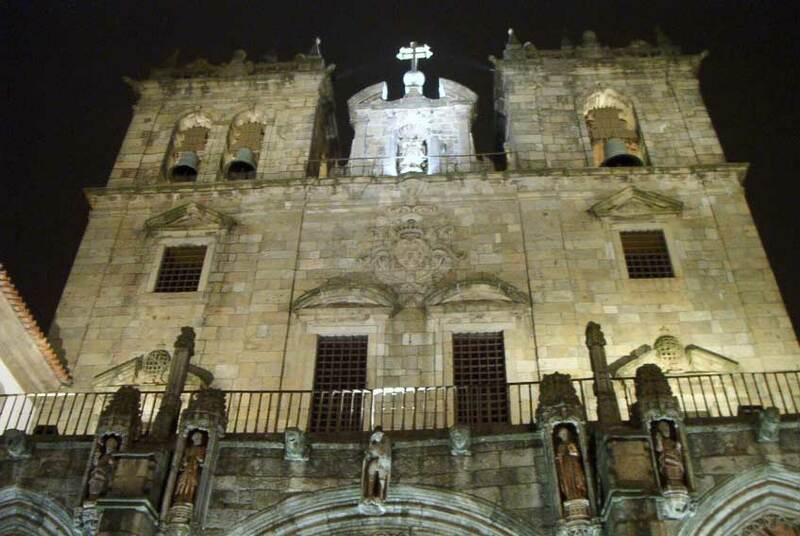 A particularly good time to visit the majestic and heavily spiritual city of Braga would certainly be during Semana Santa (Holy Week/Easter) when solemn ceremonies and processions remembering the death and rise of Christ are held. All are impressive with the devoted wearing black habits and carrying torches or effigies of Christ and the Madonna through the city streets. The procession of Senhor Ecce Homo is probably the most popular. Continuing the religious vein, the hilltop pilgrimage destination of Bom Jesus do Monte (4 km out of Braga) is particularly impressive. 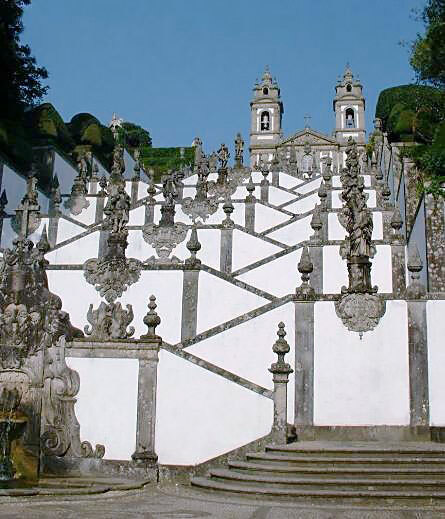 The baroque double granite terraced stairway presents a breathtaking climb in all senses of the word – peppered with grottoes, small chapels, gardens, sculptures and ornate fountains, the many steps zigzag up the hillside to the church which offers alongside a final destination for pilgrims, often climbing on their knees, spectacular views of the surrounding countryside.